Refer a friend and receive £100! We are always on the lookout for ambitious people to sign up to our apprenticeship programmes. If you are already an Estio apprentice, and have a friend who you think would also benefit from one of our IT or Digital apprenticeships, then send them our way. The IT and Tech industry can be incredibly versatile so if you have more than one friend then refer them all! Soon they can also benefit from working in a rapidly growing industry whilst achieving qualifications and earning a salary. 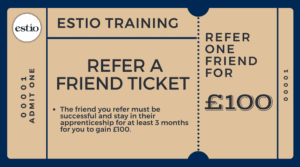 If they are successfully placed within an apprenticeship through Estio and stay on the programme for at least 3 months you will receive £100 as part of our Referral Scheme. Simply send both your own details and your friend’s details to marketing@estio.co.uk.